Abū Rayḥān Muḥammad ibn Aḥmad al-Bīrūnī (September 15, 973 in Kath, Khwarezm – December 13, 1048 in Ghazni) was a Persian polymath scholar of the 11th century. He was a scientist and physicist, an anthropologist and psychologist, an astronomer, a chemist, a critic of alchemy and astrology, an encyclopedist and historian, a geographer and traveller, a geodesist and geologist, a mathematician, a pharmacist and physician, an Islamic philosopher and Shia theologian, and a scholar and teacher, and he contributed greatly to all of these fields. He was the first Muslim scholar to study India and the Brahminical tradition,and has been described as the father of Indology,the father of geodesy, and “the first anthropologist”. He was also one of the earliest leading exponents of the experimental scientific method, and was responsible for introducing the experimental method into mechanics and mineralogy, a pioneer of comparative sociology and experimental psychology, and the first to conduct elaborate experiments related to astronomical phenomena. The Al-Biruni crater, on the Moon, is named after Biruni. Tashkent Technical University (formerly Tashkent Polytechnic Institute) is also named after Abu Rayhan al-Biruni. He was born in Khwarazm formerly north-eastern part of the presently in Khiva, Uzbekistan. He studied mathematics and astronomy under Abu Nasr Mansur. He was a colleague of the fellow philosopher and physician Abū Alī ibn Sīnā (Avicenna), the historian, philosopher and ethicist Ibn Miskawayh, in a university and science center established by prince Abu al-Abbas Ma’mun Khawarazmshah. He also travelled to South Asia or Central Asia (Modern Day Afghanistan) with Mahmud of Ghazni (whose son and successor Masud was, however, his major patron), and accompanied him on his campaigns in India (in 1030), learning Indian languages, and studying the religion and philosophy of its people. There, he also wrote his Ta’rikh al-Hind (“Chronicles of India”). Biruni wrote his books in Arabic and his native language Persian, though he knew no less than four other languages: Greek, Sanskrit, Syriac, and possibly Berber. He was buried in Ghazni in Afghanistan. 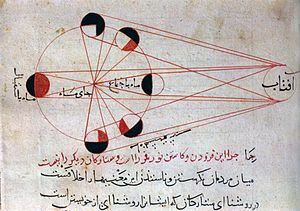 The Remaining Signs of Past Centuries (Arabic الآثار الباقية عن القرون الخالية) – a comparative study of calendars of different cultures and civilizations, interlaced with mathematical, astronomical, and historical information.